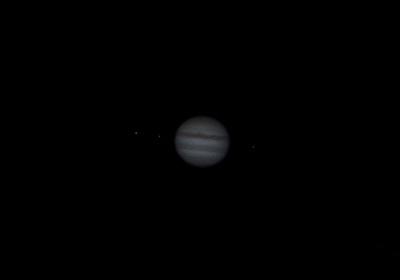 managed to shoot Jupiter thanks to some good clear skies in Delhi and Jupiter being at a favourable position in the sky. three of Jupiter’s moons can be seen in the first photo while in the second photo the Great red spot can be seen at bottom left, while the shadow of Io(moon) can be seen centre left. shooting the planets requires really high magnification. the effective focal length of the setup in this case would be around 3000-3500mm achieved with a process which involves projecting the image through the telescope eyepiece directly onto the camera sensor, with the camera lens removed. this is not a single shot but a ‘stack’ of many separate exposures. the process improves the signal to noise ratio by reducing the random digital noise and adding the light signals which can be then improved digitally. technical stuff: eyepiece projection method with a Celestron 4-inch Maksutov telescope. focal length 1325mm. Eyepiece 15mm. distance of the eyepiece from the camera sensor about 7-8cms. Nikon D90. stacked 20 stills of 1/10sec at 800ISO.